The aberrant proliferation of tumor cells and abundant vasculature in tumor tissues are closely correlated with receptors that are specifically dysregulated in tumor cells. These tumor-associated targets are critical in early diagnosis and therapy selection. Ligands such as antibodies, proteins, polypeptides and polysaccharides that specifically bind to these targets can significantly improve the detection and cure rate when used as tumor imaging probes or anti-tumor agents. 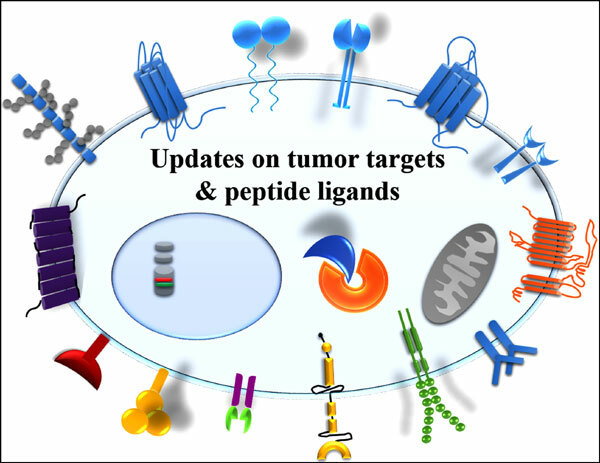 Compared to other targeting ligands, peptides have attracted increasingly more attention in tumor diagnostics and therapeutics because of their small sizes, high affinity, stability, ease of modification and low immunogenicity. Several peptide-based imaging probes and therapeutic agents have already been used in clinical trials. This review summarizes some of the tumor-associated targets and their corresponding peptides, as well as the potential of these peptides in cancer treatment. Keywords: Tumor, tumor-specific receptor, targeting peptide, diagnostic, Imaging probe, therapeutic, drug delivery. Keywords:Tumor, tumor-specific receptor, targeting peptide, diagnostic, Imaging probe, therapeutic, drug delivery. Abstract:The aberrant proliferation of tumor cells and abundant vasculature in tumor tissues are closely correlated with receptors that are specifically dysregulated in tumor cells. These tumor-associated targets are critical in early diagnosis and therapy selection. Ligands such as antibodies, proteins, polypeptides and polysaccharides that specifically bind to these targets can significantly improve the detection and cure rate when used as tumor imaging probes or anti-tumor agents. Compared to other targeting ligands, peptides have attracted increasingly more attention in tumor diagnostics and therapeutics because of their small sizes, high affinity, stability, ease of modification and low immunogenicity. Several peptide-based imaging probes and therapeutic agents have already been used in clinical trials. This review summarizes some of the tumor-associated targets and their corresponding peptides, as well as the potential of these peptides in cancer treatment.